an obstacle. In an instant, Electronic Stability Control can recognize the problem and take corrective actions: Actions like applying an individual brake to correct steering direction or by reducing engine speed. Provided that the tires have good traction during ESC control, you can safely avoid an accident. ESC is so effective that vehicle accident fatalities were reduced by more than 25% over a five year period. 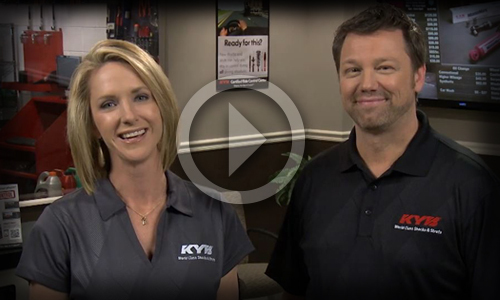 Estimates are that ESC helps avoid 600,000 accidents every year and reduces vehicle roll-overs by 75%. But ESC isn’t new. It was optional equipment in the late 90’s and then grew to being standard equipment on more than 50% of vehicles sold during 2007. ESC and crash avoidance systems actually began with the development of antilock brakes and then traction control. ESC was created by the addition of a Yaw sensor and a computer capable of making more decisions and then sending commands to the brakes and other critical control systems. Vehicle safety systems continue to improve with additional sensory inputs like proximity sensors and cameras that alert both the driver and the computer. 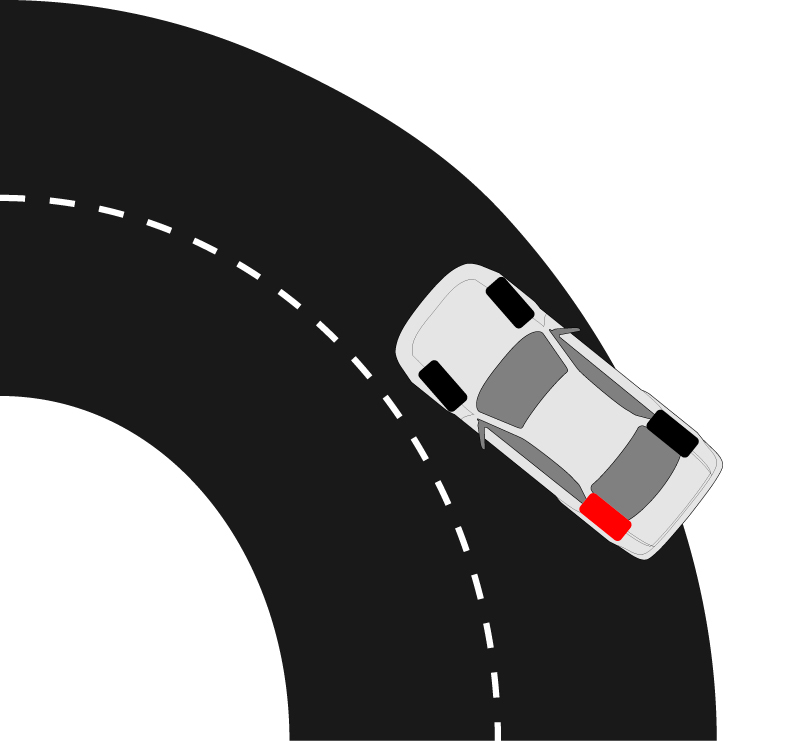 Understanding how your vehicle is equipped and maintaining the vehicle’s traction capabilities (Steering, suspension, shocks, struts, brakes and tires) is critical to the performance of crash avoidance systems. You can read a full explanation below, or watch this video demonstration from the Discovery Channel. Electronic Stability Control is designed to slow and control the vehicle from under-steer and over-steer. It uses both ABS and Traction control advantages, along with engine management and a yaw rate sensor to know when the vehicle is going a different direction than the driver intended. 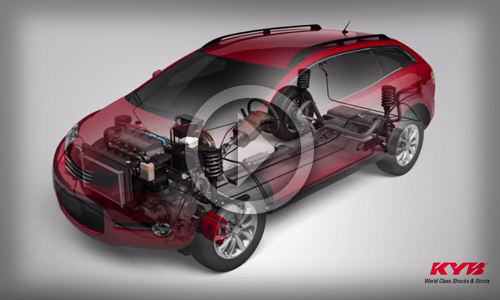 This hybrid system helps avoid spin-outs and roll-overs, which in turn, saves lives. 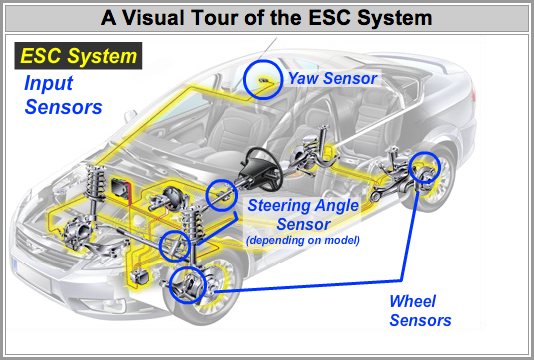 ESC uses the same sensors as ABS and Traction Control, then adds a yaw rate sensor and in some cases a steering angle sensor. This basically results in a computer system that knows the speed of every tire, the intended engine speed, the lean & roll of the vehicle on its axis, the intended steering direction, and when any tire is losing traction. The ESC Computer System is capable of more operational input and can make more rapid driving corrections than any human will ever be capable of. Wheel sensors, which monitor speed, direction and rotation. Lateral and longitudinal acceleration sensors, which monitors the vehicle’s speed and direction. A steering angle sensor, which monitors the driver’s intended direction. A yaw sensor, which monitors the vehicle for symptoms of a skid (also known as “spinning out of control”). ABS, Traction Control, and ESC all control the vehicle by modulating brakes on individual wheels in precise amounts. Unlike the others, ESC also has the ability to modulate the throttle (engine speed) and transmission. Transmission control (on some models). ABS works great at preventing skidding and sliding in a straight line, and Traction Control prevents wheel slippage, but only ESC prevents vehicles from skidding during curves. ABS (Anti-lock Braking System) is designed to eliminate the tires from locking up or skidding during heavy braking. This helps keep traction and improves maneuverability. 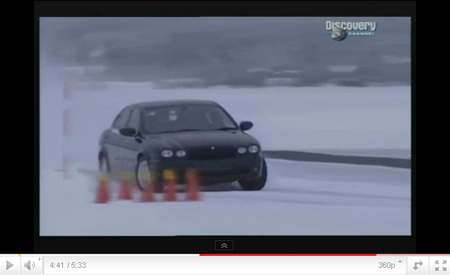 Traction Control is designed to keep the tires from spinning during acceleration, like on wet or icy conditions. This helps traction during acceleration. 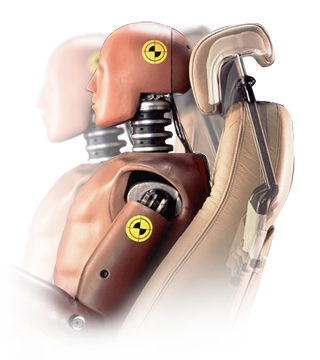 Numerous studies have shown ESC is highly effective at preventing loss-of-control and fatal crashes. The Insurance Institute for Highway Safety estimates 10,000 fatal crashes and up to 238,000 injuries could be avoided each year*. Vehicles with ESC reduce the risk a fatal loss-of-control by half. 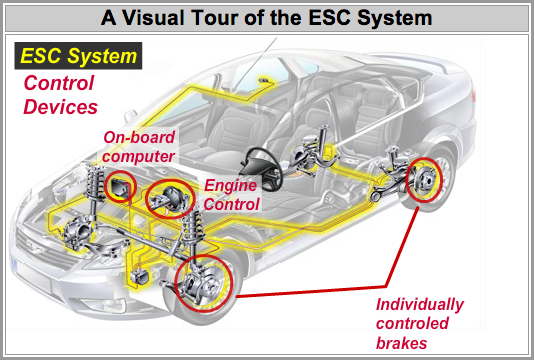 ESC has been described as the most important advancement in safety by automotive experts. (*in the United States). Estimates show that 60% of all vehicles in service bays are 4 to 12 years old. There are scores of 10-11 year old ESC-equipped vehicles on the road today. Almost a third of 2005 model year vehicles have ESC and more than half of all 2007 light duty vehicles are equipped with ESC. 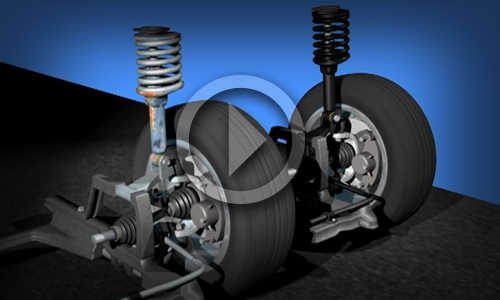 The effectiveness of ESC is limited by the ability of the tires and the vehicle’s suspension. If the tires can’t grip the road, then it’s just like driving on ice and therefore, it’s important to have good tires and ride control components that aren’t worn. 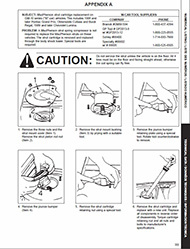 Replacement parts (like shocks and struts) must be calibrated to perform within the vehicle’s design. Some aftermarket parts (especially low cost/low quality parts) are not as capable. These parts will affect the performance of ESC and may cause brakes to apply when you don’t want them to. While the electronic components of your ESC system won’t wear like tires, shocks, struts, or brakes; they should be inspected on a regular basis. 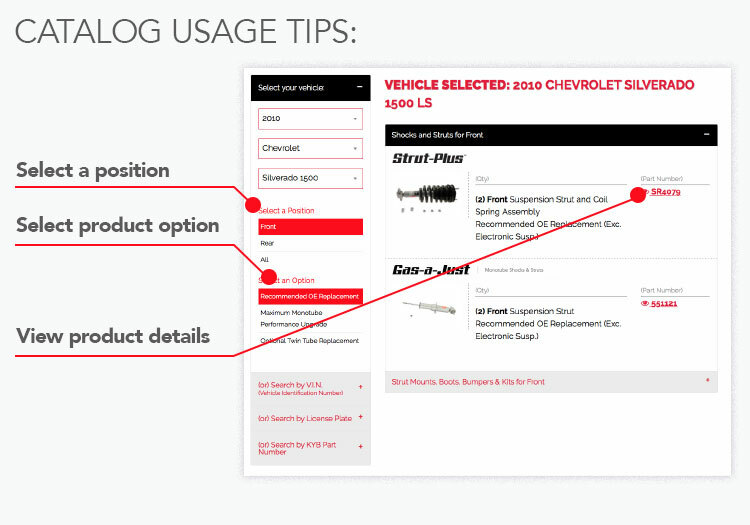 Check your Owner’s Manual for a schedule provided by the manufacturer. Wearable parts like the brakes, shocks, struts, and tires all require regular maintenance and periodic replacement. 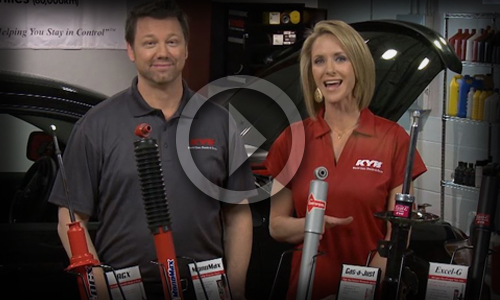 Automotive experts agree: We suggest replacing OE shocks and struts after 50,000 miles (80,000 kilometers). Brake and tire wear rates vary, so ask your local Certified Ride Control Specialist to inspect them and other components that affect ESC. With proper maintenance, you can be sure that ESC will continue to keep your vehicle operating as it was designed.